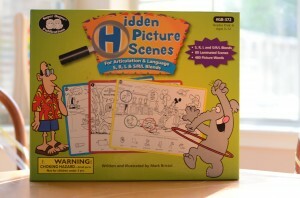 Hidden Picture Scenes: Review and Giveaway! The Hidden Picture Scenes for Articulation and Language from Super Duper Publications consist of 80 laminated word scenes (40 cards with scenes on both sides) to target /s,r,l/ and /s,r,l/ blends. 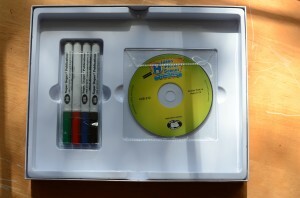 Included in the box are 4 wet erase markers and a CD ROM of ALL 80 cards in a printable format! The cards have picture scenes with targeted words (by sound) hidden within them. At the bottom of each card, there is a sentence containing several words with the target sound (for example, on the SL card the sentence is Sloan served sloppy joes to the Slovenian sled dog team.) as well labeled pictures of the target words to find within the picture. Hidden Picture Scenes for Articulation and Language offers students an amusing, interest-capturing way to practice their S, R, L and S/R/L Blends sounds. It also helps young ones learn and review 480 basic vocabulary words while using their fine motor skills. Each hilarious scene has a sentence with target sounds plus six target picture-words. Students listen to and say a sentence with the target words. Then students find each picture-word hidden in the illustration and use the wet-erase markers to circle them. Hidden Picture Scenes also helps students build their vocabulary and describing skills. Hidden Pictures are FUN. Simply said, hidden pictures are just fun. The client I used these with as well as my own daughter LOVED finding the items in the pictures. Therefore, these are motivating for kids who enjoy hidden pictures. Dry Erase is fun. Another thing so many kids love is dry erase boards/markers. I have found that having several dry erase boards and markers available for kids when I have group will give them something to do. Well these cards are like dry erase boards which makes them fun to draw, color, write on, etc. Picture scenes can be used to tackle SO much more than articulation. I think my second favorite thing about this product (you’ll see my #1 favorite next) is that these cards can be used to target SO MANY GOALS. Articulation, fluency, grammar, story telling, vocabulary, antonyms and synonyms, answering and asking WH questions, pragmatic language…don’t think that just because the cards are organized by sound that you have to use them just for articulation! I don’t know about you, but when I am going to drop money on a product, you better believe that it better serve more than one purpose! The CD ROM. So I was pretty excited when I saw this came with a CD ROM. My first thought was YES! I can print these and send them as homework! But then as I started using the product I realized that the CD ROM is basically what makes this product awesome for use with groups. You see…you get 40 cards, with one picture scene on each side. This is fine for groups if all the kids are working on different sounds. But what if you have a whole group working on initial /r/? The CD ROM makes this simple: Just print out multiple copies of the cards for the groups and then either place in page protectors or laminate. BOOM. Now you have multiple erasable cards! I’ll be honest…if this didn’t come with the CD ROM, it simply wouldn’t be as useful for SLPs in the schools that often have to work with large groups. I’d love to see some of these for phonological processes (Since I mostly work with little guys) and for some other sound groups. Play “I Spy” and have the children pick an item in the picture and describe it to others (describing, articulation, grammar, fluency). Print off copies for each person (or maybe in pairs) and have the children use them in a barrier game format. (Want to learn more about Barrier Games? Check out my post HERE.) This targets following and giving directions, prepositions and other concepts, grammar, fluency, articulation, etc. Use the sentence on the card as a tongue twister…see how many times your student can say the whole sentence CORRECT in a row! Have your students repeat the target words on each card as many times as they can CORRECTLY in 30 or 60 seconds…who can say the most? Have your students make up and tell a whole story based on the picture (you can have them write it down when they are waiting their turn at a game or what-have-you). This targets grammar, describing skills, vocabulary, fluency, etc. Check out the product’s box for more ways to use this in your therapy. Yes I would. These are cool…but ESPECIALLY because of the CD ROM! It makes this product so much more usable when working with groups of children. And the price isn’t bad either! So guess what? The awesome people at Super Duper Publications would love for one of my readers to win their own set of these awesome cards! If you win Super Duper will send you your own set! All you have to do is enter using the Rafflecopter Widget below. This giveaway will be open until Sunday July 29th at 11:59pm Eastern. Ages 18 and up, US and Canada residents only. Please read full terms and conditions before entering. Winners will be contacted via email and will be announced on Monday July 30th in a blog post as well. GOOD LUCK!! Disclosure: The product in this review was provided to me by Super Duper Publications. However all opinions in the review are authentic and mine alone. Spending time with my kiddos! I’ve got a two year old and a one week old..I’m soaking it all in! play with my kids and spend time at the lake! I plan to rest after remodeling the master bathroom! Heading for vacation out west tomorrow! Then working the rest of the month! It can’t be August already can it? Ack! Great giveaway Katie! Getting ready for my 1st year as an SLP!! Heading to visit family for 3 weeks on the West Coast. Start the to-do list I made in May to help me get organized for the next school year. Where has the summer gone?! Staying cool during this hot weather! I plan to spend the rest of my summer spending time with my family…then a little bit of time organizing my new space at school! We are going to spend the rest of the summer going to local places like the zoo, the museum, and lion country safari. Complete some projects and attempt to stay cool! Spend time with my kids and hubby and read great blogs like this one! Trying to have fun with my kis as well as starting to get organized for work. I’m super excited that Trevy is going for a week of summer day camp this year! The big kids are always plugged into something during the summer…but this will be his first time. Work, work, work! And prepping for the coming school year. Our family and extended family are travelling this weekend to the beach. Looking forward to splashing in the lake. I’m looking forward to teaching some staff development classes and soending some quality time with family! That looks like too much fun! My students would love it. For the rest of the summer I plan on tackling my reading list…all of the articles and books I was too exhausted to read at the end of the year. Hopefully I’ll come back to school with a lot of new knowledge. Organizing my work materials in preparation for starting my own practice! Have lots of projects planned and just spending quality time with my two boys : ) Thanks for the chance to win ! My plans for the rest of the summer include creating materials and lesson plans, organizing, and moving! Swim, hang out with my kids, and work on getting my room ready at school! Plan, plan, plan as much as I can for my 55 kiddos headed back to speech in less than a week! eek! I have two weeks left of summer! I have been working a speech camp most of the break and I am ready for some rest! I plan on going home to spend some time with my parents! Summertime=family fun, house projects, & prep for the coming school year.